You'll be hard-pressed to find the same level of expertise that our Tucson Mobile Auto Repair specialists provide! We have years of experience working on both domestic and import vehicles of all makes and models and can work with you to find cost-effective repair and maintenance alternatives. ​We are in Tucson, AZ. Not only do you get the convenience of not being inconvenienced you also get unbeatable prices. 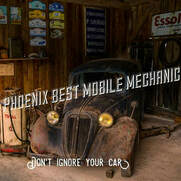 Tucson Mobile Auto Repair doesn’t have the overhead of a traditional repair facility. We are able to forward these savings directly to you; saving you time, money, and generally making your experience a pleasant one, instead of a nightmare. We don’t try to up sell you on things you don’t need. We simply give you the facts and let you decide. You will also enjoy a traditional warranty with all your repairs. For a high-performing vehicle, trust Tucson Mobile Auto Repair with your car, truck, or van. To learn more about the services we offer, please contact us by phone at 602-975-4967.